This photo, taken on September 12, 2011, shows the resort where David and Judith Tebbutt were attacked. 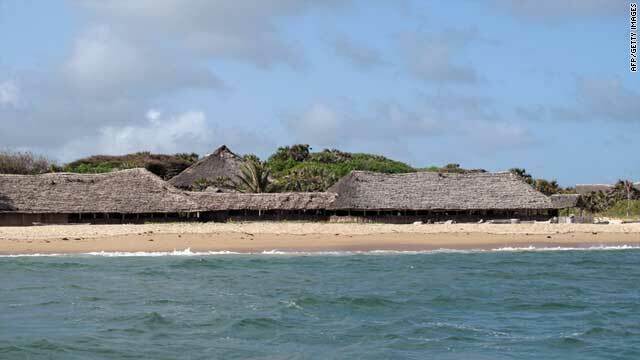 Nairobi, Kenya (CNN) -- An English tourist kidnapped from a remote Kenyan resort is being held by Somali pirates in a remote corner of the lawless country, according to experts and security analysts in Nairobi. "Gangs from Southern Somalia took her up the coast and then moved her several times," said Andrew Mwangura, a piracy expert and maritime editor of Somalia Report, an independent online publication. Judith Tebbutt was abducted by armed men from a remote safari lodge near to the Somali border earlier this month. Her husband, David Tebbutt, was killed in the attack when he resisted, according to Kenyan police. Details of the incident are still sketchy and the British government has asked journalists not to reveal the exact location of Tebbutt to avoid abduction attempts from rival gangs. Initially, it was feared that al-Shabaab, the al Qaeda-linked militant group, had conducted the operation as a revenge attack against the British nationals. But a security analyst based in Nairobi, who tracks piracy operations but is not authorized to speak to the media, also believes this is the work of pirates. "This is not the work of al-Shabaab," he said, "this is the work of Southern armed gangs and pirates." No ransom demands have been made yet, says Mwangura. But if Somali pirates carried out the operation, it represents a marked departure in tactics. For years, pirates have attacked commercial ships in the busy shipping lanes between Europe and Asia. A cargo ship has insurance, and after months of negotiations pirates can often clear several million U.S. dollars. Some analysts believe that Somali pirates are now moving onto land because it's getting harder out at sea. "Their inability to operate freely in the their waters is forcing them onto land," says Andrews Atta-Asamoah, a senior researcher at the Institute for Security Studies. "It's significant if you place it in the context of the struggle against piracy. Since the whole push against piracy by international navies, the pirates have been looking for new territory and new frontiers." Atta-Asamoah says that Kenya is a natural target because if its porous border with Somalia and a high number of foreign visitors and workers. The Kenyan government, prompted by their reliance on tourism for foreign exchange, says they are making every effort to secure the border with Somalia. Others say that, rather than a trend, this is a one-time attack caused by a more prosaic fact: the weather. Monsoon rains off the coast of Somalia at this time of year makes operating offshore difficult. "This incident is a special case," says Mwangura.